A deep, dark and profound stout. Espresso coffee is infused during the brewing of Péché Mortel, resulting in an intense dark beer with roasted malt flavours enhanced by bitter coffee. The dry finish is long and persistent. Intended as a tasting experience,we invite you to enjoy this brew in moderation. This beer was first crafted at our Montreal location in October of 2001. Imperial Coffee Stout aged in Bourbon barrels, 9.5 % alc/vol..
Péché Mortel is an intensely black and dense stout in which coffee is infused during the brewing process. The result is a strong beer where prominent roasted flavours coalesce with a powerful taste of coffee. Once fermentation is complete, the beer is aged several months in bourbon oak barrels, which imparts some vanilla and woody aromas as well as bourbon flavours. This beer was first crafted at our Montreal location in May of 2009. Imperial Coffee Stout brewed with raspberries, 9.5 % alc/vol. Péché Mortel Framboise has been brewed with real raspberries. The fruity acidity compliments the roasted taste of the coffee for added complexity. This beer was first crafted in our St-Jérôme brewery in January of 2017. Imperial Coffee Stout, 9.5 % alc/vol. Péché Mortel Houblon is a stout infused with Fazenda Barinas and Sidama (Ethiopia) coffee varieties. This version is a cross between an India Pale Ale and our regular Péché Mortel, distinguished by the use of a washed coffee, chosen for its high quality grains and dry hopped with Denali and El Dorado hops. The richness of roasted aromas is balanced by a fruity and spicy side, reminiscent of orange peel. The acidity of the coffees complements the bitterness of the hops, giving a long, lingering finish. This beer was first crafted in our St-Jérôme brewery in December of 2017. Imperial Coffee Milk Stout, 9.5 % alc/vol. 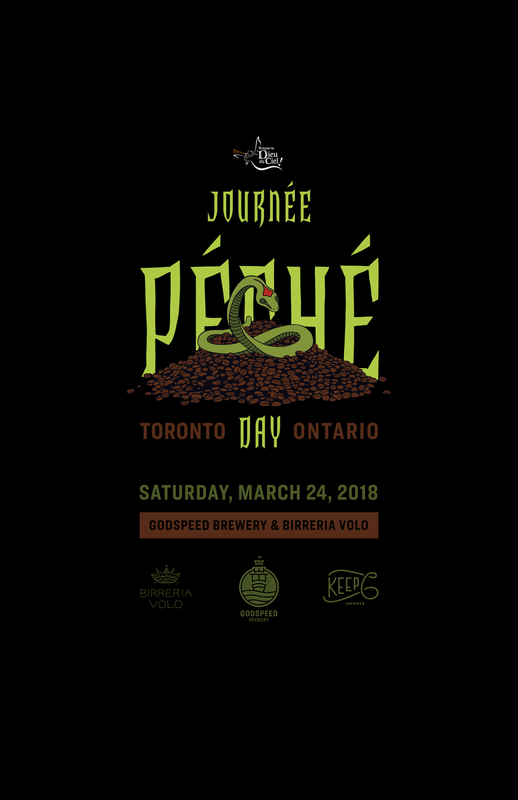 The Péché Latté is an Imperial Stout brewed with coffee and lactose. Fuller than our classic version, its powerful coffee taste is complimented by the sweet flavour of frothed milk. This beer was first brewed in our Montréal brewpub in March 2017. Imperial Coffee Stout with coffee from Las Termopilas, 9.5 % alc/vol. The Termopilas Péché is an Imperial Stout brewed with the coffee of the same name ! The light roast softens the roasted flavours to let the nutty flavours shine through. The beer is also slightly more acidic than the classic Péché Mortel. This beer was first crafted in our St-Jérôme brewery in December of 2016.